What To Do When You Cannot Find A Parking Space? As a driver, i am constantly frustrated when it comes to finding parking spaces. Most of the time when i'm in a rush, i have to risk parking in illegitimate spaces and risking a fine. I'm sure most drivers also face this kind of problem. So is there any way to counter this problem? A woman from China here seemed to have found the perfect way. She pirated the parking space! Oh you can do it the good ol' Malaysian way. But i still like the China girl's method better. At least we don't get fined or anything. Thanks Joshua for the video! 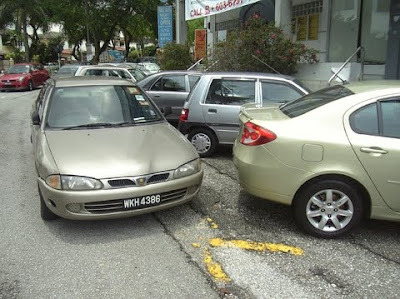 Malaysia is notorious for terrible double parking. It is alright to double park as long as you keep an eye out for your car in case the person you are blocking wants to leave. Some people can be SO inconsiderate. they are acting only...! am i right? HAHA LMAO la that lady!